I knew we were going to turn this into a book shelf. Our old one had broken, finally. 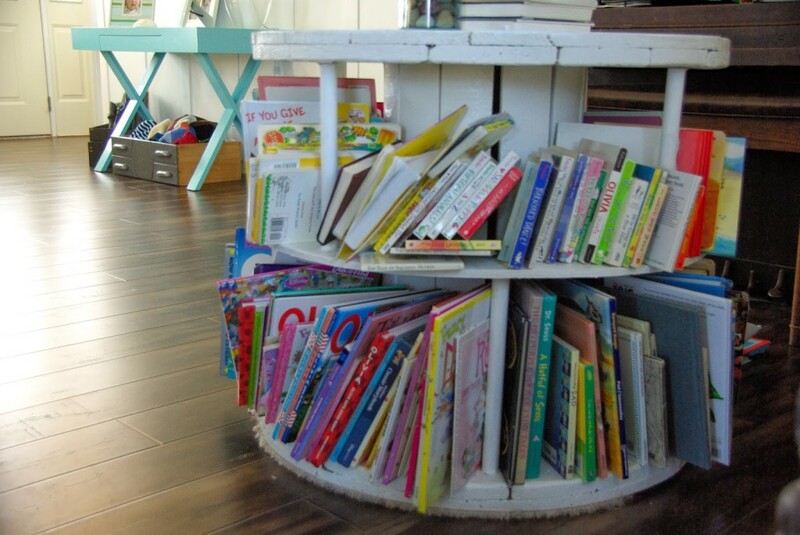 And had been taken apart and turned into our kids art table, you can read about that here. 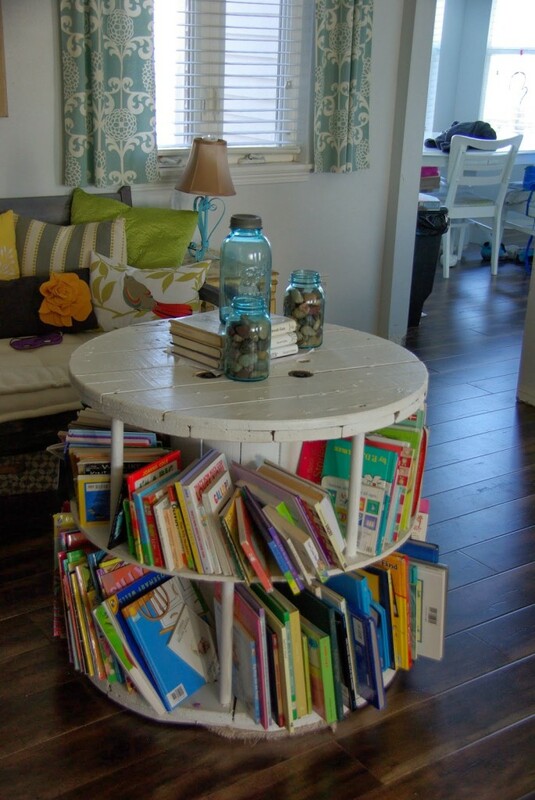 I had settled on painting the spool book table white, after much thinking and considering of other colors. I wonder how often people go around and around with different color ideas only to settle on white? * place the two halves on either side of the large spool base, cut it around the wide base of the spool. We then had the template for the shelf in the middle of the spool. * I took the circle cut template and placed it over the already cut ply wood, and traced it. To create the shelf and make it fit snuggly around the middle of the spool. * To connect the shelf and hold it in place we purchased 3/4 of an inch wide doll rods. We cut them down to the desired size (1 foot). I wanted the shelf to be even with the top and the bottom. * Once those are cut we nailed the doll rods from the top and the bottom. * Glue the other side of the doll rod (not nailed to the top of the spool table) into the shelf itself. I wanted them staggered through out the shelf. We ended up with 4 one foot doll rods on each shelf. They were placed about 1/2 inch into the shelf. Once that was done we painted the massive screws black, to make them stand out. They were just a rusty color before. And also on the bottom we drilled with a hole saw deeper to make the screws flush with the wood portion of the spool. My plan is to eventually get a glass fitted for the top, but for now the wood alone will have to work. After that we painted it all white. Three coats later the books were ready to go in. It holds roughly 90 books. I am not for sure on the amount but I know it is a lot of books. There is no leaning of the shelves because we placed each doll rods in varying locations to add more support. Drilling the doll rods is key, otherwise the glue will not stick long term and they will fall out. Then books cannot stay on the shelf and you have a big mess. Not that we would now or anything :). 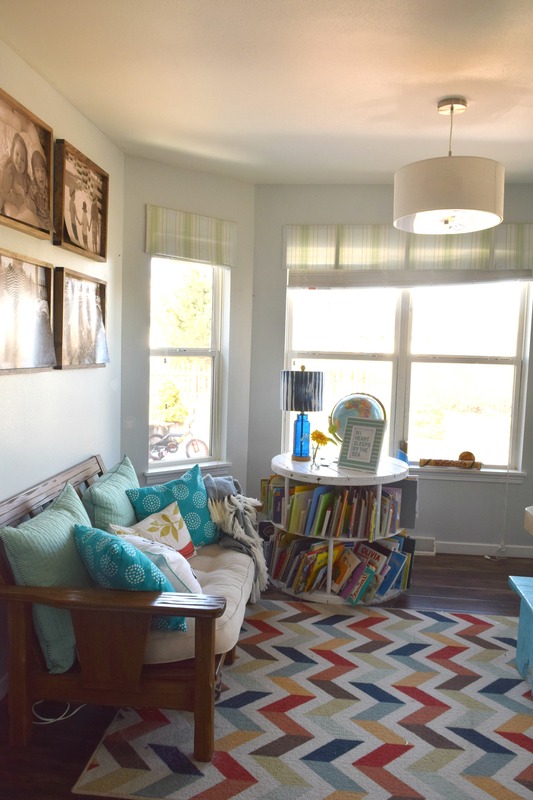 It takes a little work to keep the books in them, but that is any shelf with kids. They just jam them in. We have wood floors and set a piece of our old carpet cut to fit the bottom of the table so that the screws on the bottom would not damage the floors. We can also move it if necessary that way, since it is very heavy. I think it turned out great, I want one for my room now. It is something that is not seen a lot, and really makes the books part of the decor instead of shoved in the corner. This is so creative- way to go! This is awesome!!!! what a great idea!!! 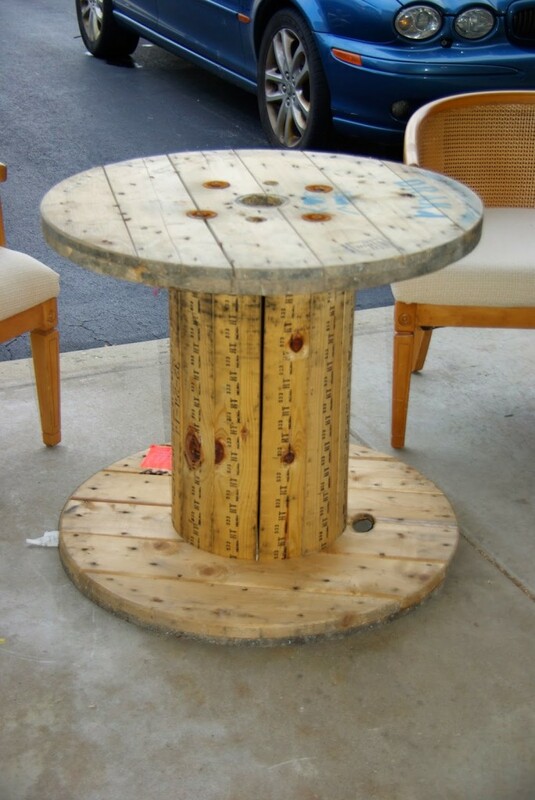 I've always wanted a spool, but other than making a table out of it, I couldn't imagine what to do with it. Now, I know! 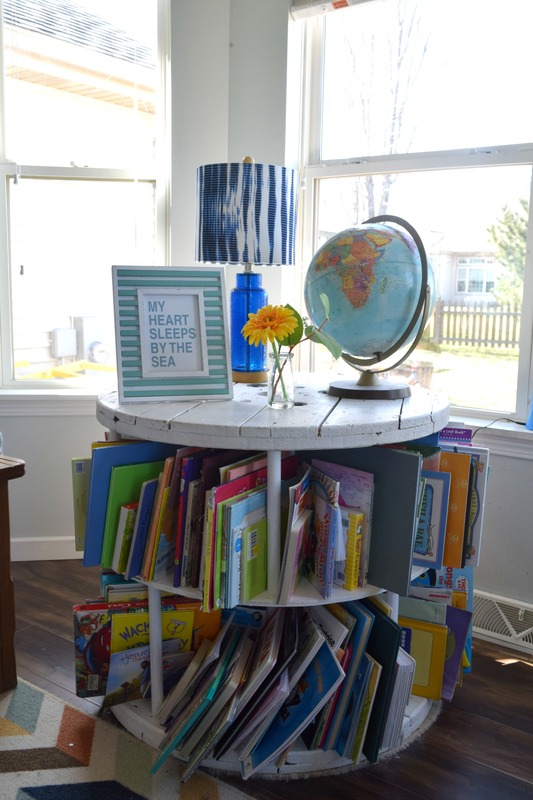 Awesome upcycle! I am so glad I could give you some inspiration! It was a fairly easy job, and it is something people compliment me on anytime they are in my home. So I am sure yours will be just as eye catching. Good luck! Amazing! Creative! And FUN! Great idea! Thanks for sharing! Love it! It looks great- saw you on Snickerdoodle Sunday. Love this!!!! Thank you for linking up at the Snickerdoodle Sumday! Oh my gosh I love it! I HAVE to have one! Thanks for linking up to Snickerdoodle Sunday!!! I am glad you liked it, thank you so much for featuring me. I will be linking up on Friday again!